I have returned to the land of Tea and Sales and Christmas Craft Markets. I recently attended the 27th Annual Seaside Christmas, sponsored by the Seaside Tourism & Business Association for the Eastern Shore of Nova Scotia. It took place over three days in mid-November, and included 19 stops from Lawrencetown Beach to Salmon River Bridge, a route spanning some 45 km. Numbered wreaths guided the journey. One of the most interesting places was Old Times, Old Friends Antiques, Collectibles and Dolls, located in Musquodoboit Harbour in a very out of the way and enchanted seaside spot. The tiny shop is actually part of the owner’s home, and is bursting with items from yesteryear. And they serve shortbread to you as soon as you walk in the door! I found some plates in my china pattern, Johnson Brothers’ Shakespeare’s Sonnets, for a very reasonable price. And I was thrilled when I spotted two pen/ink stands minding their own business on a bottom shelf. A little bit of bling for the desk eh? These brass inkstands were made in Belgium around 1910, apparently. I was able to find them on various ebay sites so they appear to have been a pretty common item at the time of manufacture. So nothing especially rare and not that expensive; I paid $65 for both and that price is in keeping with what they are listed for on the various ebay sites I visited. Here’s the pen stand. So fancy! We’ve got angels and flowers aplenty. It came with the pen but the pen is in very sad shape. It looks old and well used. I might review it in more detail once I ink it up but for this post I want to focus on the stand. I thought it was just divine. Here we have an angel playing a horn to his friend the donkey. I’m not sure of the significance, if any, of these creatures but it is very charming. And here is the ink stand. It doesn’t match the pen stand but they do look nice on the desk together. The sides could act as a pen rest, or a cartridge holder. I imagine the idea was to decant the ink into the white liner and dip your pen into it. I won’t be doing that; I doubt I will put anything into the liner. I just like to look at it. I will definitely be returning to Old Times, Old Friends Antiques. There was a lot to see and I’m sure I missed some amazing treasures. It’s worth the trip for the shortbread alone! A couple of dear friends were in town this past week and one day we found ourselves in Windsor, Nova Scotia. We had amazing fish and chips at Frydaddy’s and then wandered up and down the main street. I found myself drawn to a small stationery store called Brooklyn Office Supplies Ltd. I hoped for a fountain pen or two, since a nib is featured in their logo. Unfortunately they no longer carry fountain pens. The proprietor told me they can no longer order them, which is a shame. They do still carry cartridges and bottled ink, so I picked up two bottles of Sheaffer Skrip, one in black and one in blue. You’ll notice some tape on the cap of the black ink. I didn’t notice when I bought it that the cap was broken. I taped it up but it is not an airtight seal so not sure if the ink is ok. Above you can see a writing sample using both inks, written with my glass pen. 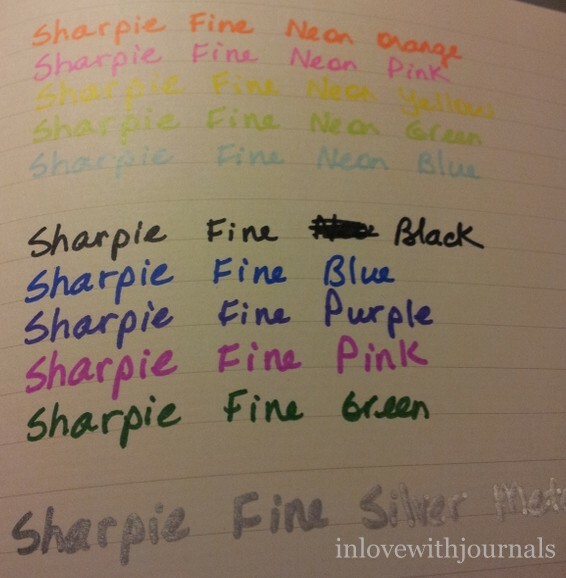 Both ink colours are vibrant and true. Unfortunately that black ink is stuck onto my glass pen now. I can scrape some of it off with my fingernail but it is a slow process. Keep in mind the black remained even after the blue test. Perhaps the broken cap has allowed air to impact the black ink somehow. Lesson learned: examine ink bottles before buying them, especially in independent stores with low traffic. I am happy to add two new inks to my collection, from a brand I have never tried before. At this point though I would not put the black ink in any pen that might show a stain. 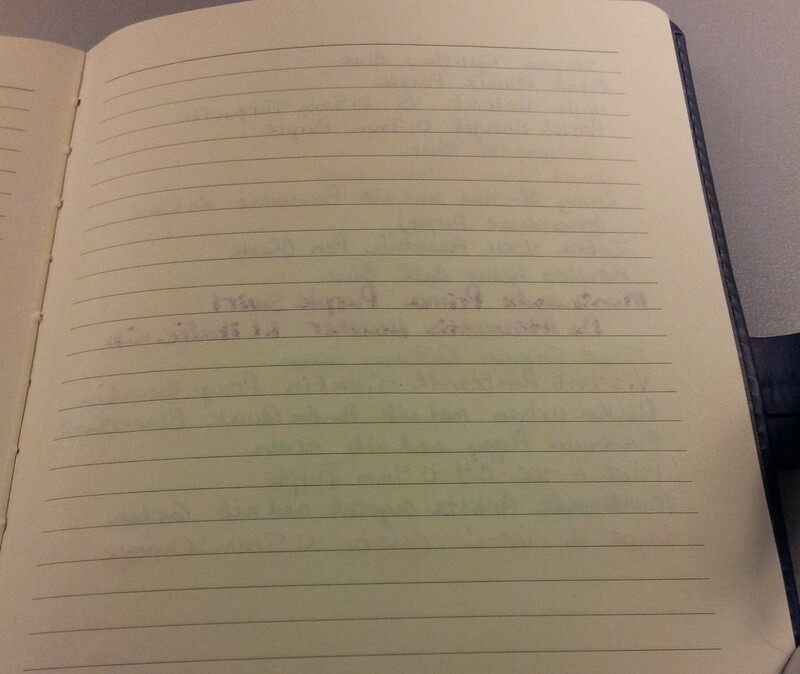 Both inks showed mild feathering in my Eccolo notebook. I will always try to support independent stationers and if you are in the neighborhood visit Brooklyn Office Supplies Ltd. as they have a charming shop with knowledgeable staff. Just make sure any ink bottles you buy are intact! Happy Thanksgiving to my fellow Canadians! I have a lot to be thankful for this year, and I wanted to share a new pen I recently acquired. A friend was in town and we went to a local shop called Into the Mystic Folklore. It’s a beautiful space in Dartmouth that sells crystals, jewelry, tarot cards, tea, etc., along with psychic readings and singing water bowls. It’s a magical place and I am thrilled my friend introduced me to it. Nestled between healing bracelets and gargoyle bookends were glass dip pens. A local artisan, Janelle Tyler, makes and sells them through her company Gypsy Road Glass, Silver & Stone. To my delight she also makes ink in the cutest bottles, so I grabbed a couple of those too. 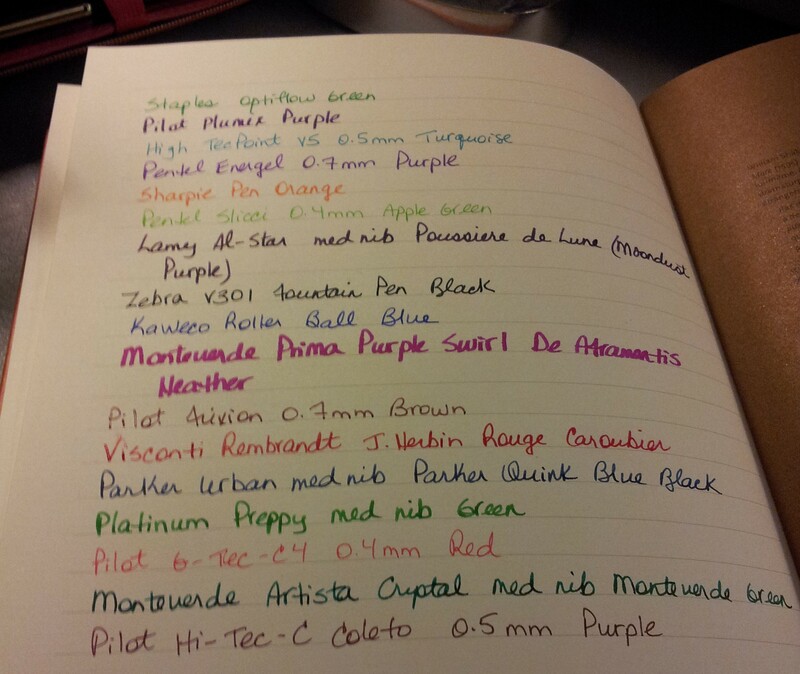 There were multi-coloured pens with different types of nibs, from broad to fine. I chose a clear one with a medium-fine nib. The pen comes with a pamphlet that talks about the history of glass pens. I did not know that in the 17th century there was a shortage of feather quills for writing. The average London banker would use up to 20 feather quills a day – can you imagine?! And the average goose was only capable of producing 8 to 10 good feathers for quills. Through trial and error German glass blowers perfected the spiral nib seen on glass pens today. The original ones would have been brittle and fragile but the pens made by contemporary glass artisans like Janelle Tyler are made from a harder material, the same glass that modern cookware is made from. I also bought two bottles of ink, both with the colour Deep Ocean. I do not know if she offers any other colours. The appeal of the glass pen to me is the fearlessness you can have with new inks – there is no chance that a questionable ink could muck up the mechanism, because there is no mechanism to muck up! And you could write a letter with a different ink for each sentence. The nib wipes clean quickly with water and a paper towel. And you are not limited to fountain pen ink – any ink will do. So much fun! Here you can see both the ink colour and the nib. 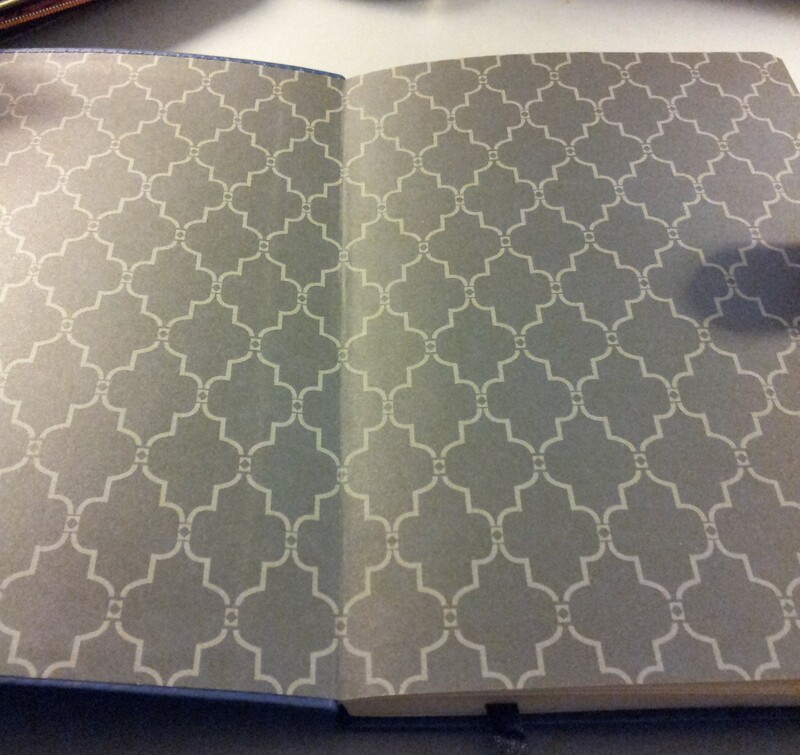 I wrote in my Things Remembered Engraved Journal with stone paper. I love this journal but have read with misgiving the fibres can sometimes clog up the works in traditional fountain pens. So the glass pen was perfect for this writing session. I love the ink colour. It’s a rich blue green perfectly named. The actual writing experience was a little challenging. The paper is a little toothy and on the upstroke the nib would sometimes catch and stop moving. But you can see there was no skipping and one dip would last for almost three sentences. This little ledge is the perfect resting spot for my glass pen. I haven’t photographed this desk before but as I unpack my office there are only so many clear spots available to shoot! I will do a proper room tour when I am all set up. So if you are wondering about glass pens I would recommend one, for their beauty and versatility with ink. I can’t believe I have waited this long to buy one. And if you are in the Dartmouth area check out Into the Mystic Folklore. You will find something that catches your eye, I guarantee it! I had a great time during my recent trip to Phoenix, and one of the highlights was visiting Jay at Scottsdale Pen and Knife again. This was my second trip to his store. my first trip was in November of 2014 and you can read about it here and here. 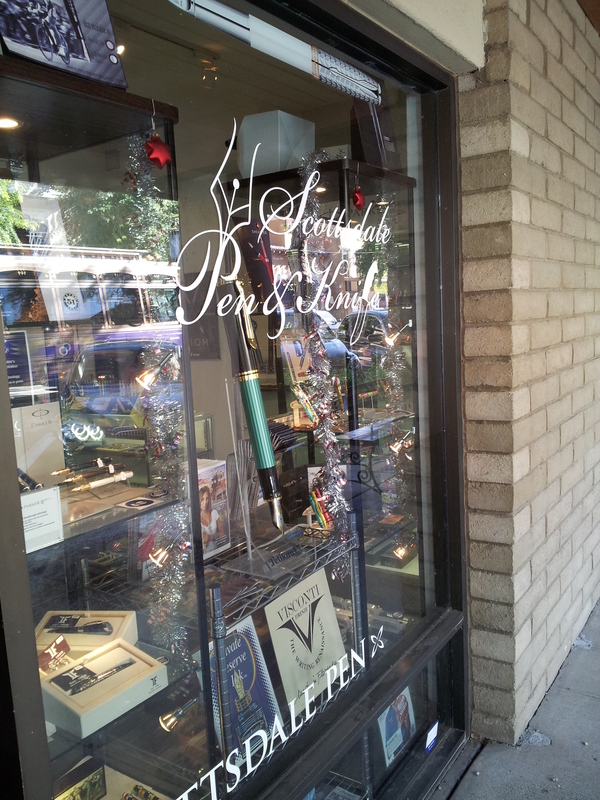 Scottsdale Pen and Knife is a beautiful retail pen, ink and journal store in Scottsdale, Arizona. My 2014 blog post has lots of pictures of his store; this year I didn’t take any. It hasn’t changed at all in terms of layout; still as welcoming and enticing as ever! I think Jay recognized us the moment we walked in. He’s an incredibly knowledgeable, warm and welcoming kind of guy and we soon fell into a great conversation about pens. My sister wanted a pretty pen and I talked about her purchase in this post, a Cross Botanica in the Green Daylily pattern. 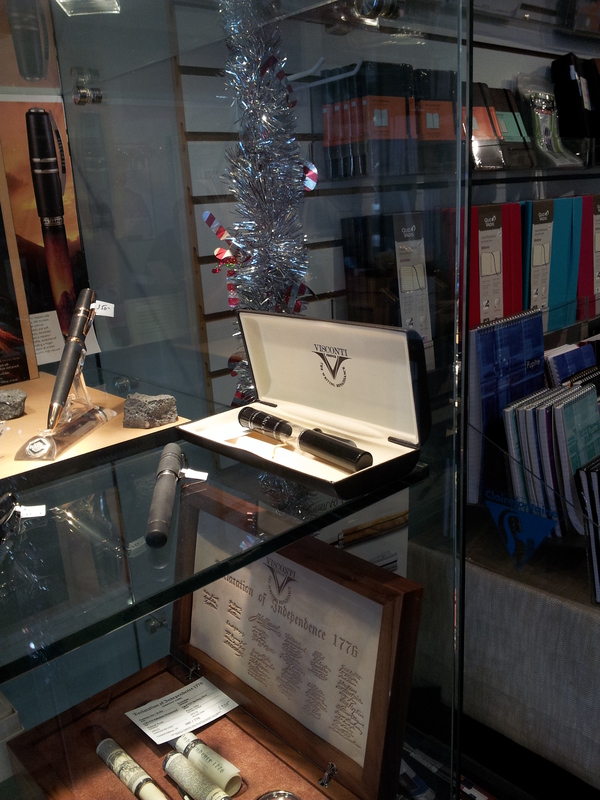 My eye was caught by the Visconti display; you can’t help but notice those beautiful pens. Front and centre was the latest, The Crimson Tide in the Opera Masters series. Such a beautiful pen. Jay mentioned he could give me a good deal on it, like reducing the price by 20%. At $1095 US, even with that discount it still didn’t fit my budget! I didn’t ask to try it out, although later I thought I should have, because I rarely get the opportunity to test out such a beautiful pen. But then I thought do I really want to know that I love such a expensive pen? I decided I was better off not knowing. We looked at almost every pen in the place, some of them twice! Parker Duofolds, Sonnets and Urbans, Viscontis, Monteverdes, Watermans, Cross, Platinum…. the list goes on and on. He has a really impressive collection, both new and vintage. I found out that the modern Watermans snap to post, which appeals to me. And he showed me a Conklin Word Gauge fountain pen in Blue Swirl, from the Conklin Heritage collection, and my heart just melted. I think I even said “This pen is going home with me!” I really wanted it but it just wasn’t in my budget. You can check it out for yourself here. Each pen has a large ink window that is etched with gradations of 1,000, 2,000, etc., which indicate the number of words that can be written with the remaining ink supply. Perfect for any writer isn’t it? It’s on my wish list, and of course Jay will ship internationally from his website. I was proud of myself for walking away from it this time. Maybe next year. Here are some photos of the items I couldn’t resist. 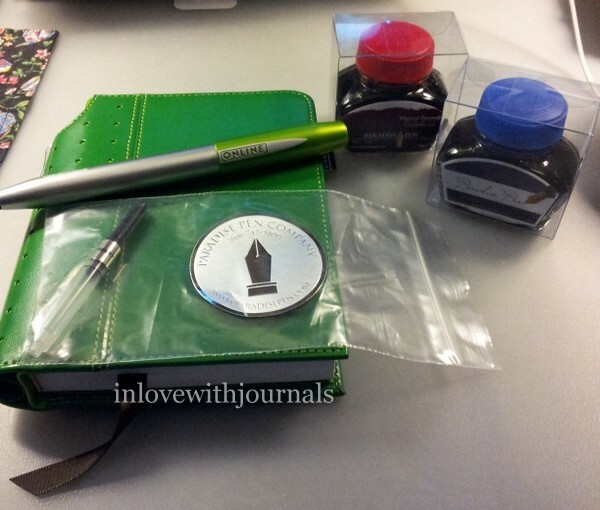 I bought a bottle of Waterman Intense Black ink, a happy buddha pen stand, and two Noodler’s Ahab pens. Jay was very generous and gave me three copies of PenWorld magazine and a Visconti bookmark. Both my sister and I were overwhelmed by his generosity. But when we protested he simply smiled and said “It’s my store, I can do what I want!” Jay’s customer service is outstanding and his enthusiasm for writing instruments is infectious. This happy fellow was in a display case with lots of other pen stands, some more ornate than others. This one appealed to me because of his size and the expression on his face. And pens sit perfectly in his little hands. The Visconti bookmark caught my eye for the first time last year and when I mentioned it this year I never dreamed Jay would simply give one to each of us. The folded paper shows some of Visconti’s flagship pens. Here’s a closeup of the bookmark. It says Visconti at the top, with 23 K Pd 950 Firenze at the bottom. So beautiful! They are for sale as well as being occasional gifts from the owner! This is the first of two Noodler’s Ahabs I purchased. I had heard good things about them and wanted to try them. This is the Maximillian Emerald Demonstrator with a fine nib. I believe this model is the most popular of the Noodler’s line. Here’s a closeup of the nib. Very smooth writer, not scratchy like a fine nib can be. They are advertised as flex nibs but I’m not into flex that much. I just enjoy writing with it normally. The Ahabs have an interesting filling system called a slide piston mechanism. It’s basically a big plunger. You simply pump it while the nib is submerged in ink. Because the plunger is also hollow the pen has an enormous ink capacity. And because there is no metal it is an excellent candidate for turning into an eye dropper. I still mean to do that one of these days. Just need an o ring; I got some silicon grease when I bought my TWSBI Eco. And here is the other Ahab I bought. This one is the King Philip Purple Demonstrator, with a medium nib. I think there may be an issue with the feed on this one; it’s sitting very low compared to the green one and I can’t seem to get very much ink to flow through it. I’ve contacted Jay to see what his advice might be. I fell in love with it’s beautiful colour. It’s a perfect match to my De Atramentis Heather Violet ink. And finally here are two quick writing samples of the green Ahab, inked with Waterman’s Harmonious Green, and the Baoer Starwalker, inked with Waterman’s Intense Black. I didn’t buy the Baoer in the store of course, just the ink. 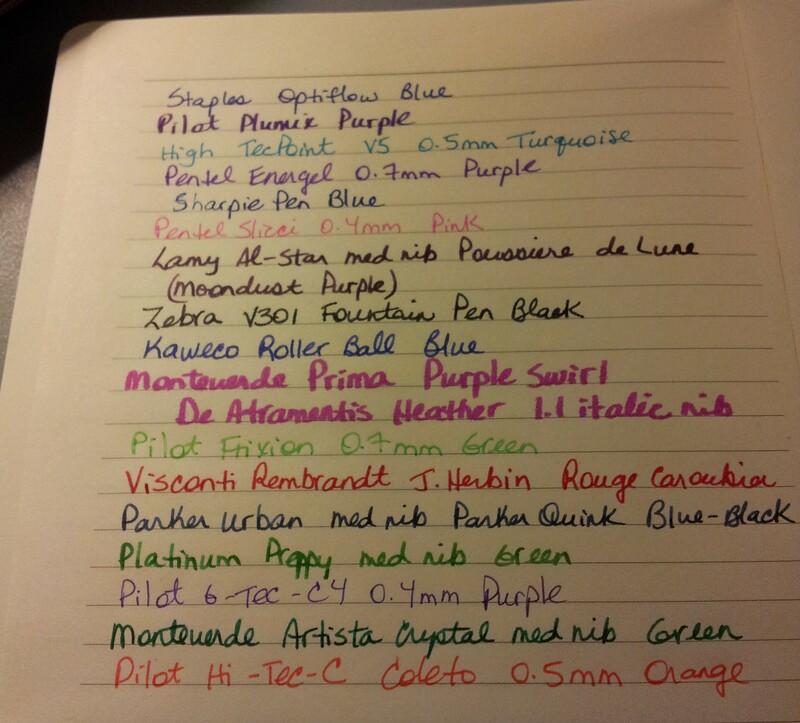 Just like all the other Waterman inks, it is a good lubricant for the pen. And the black colour is intense indeed. As a birthday present to ourselves David and I flew to Portland, Oregon to catch Vintage Trouble at the Wonder Ballroom last week. It was a magical 24 hours which included staying at a fabulous hotel (the Crowne Plaza Portland), grooving with the band (we got to meet them! ), eating amazing food and shopping. 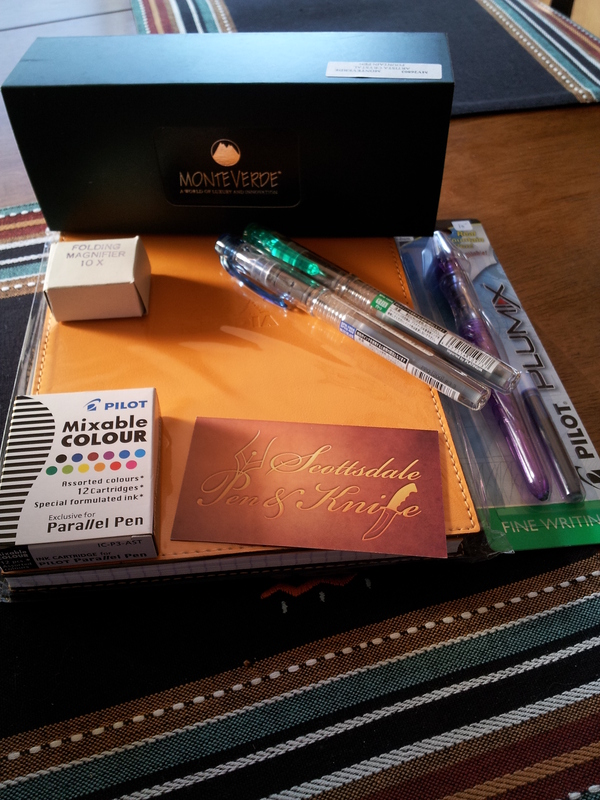 We crammed three days into 24 hours and just one of the many highlights was visiting the Paradise Pen Company, a retailer of “high-end writing instruments offering fountain pens, leather goods and accessories.” And when they say high-end they aren’t kidding. 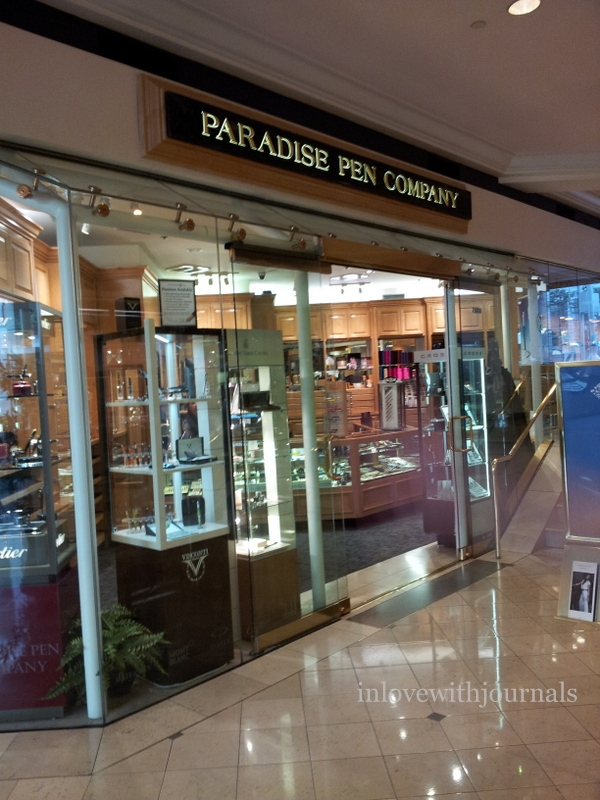 The Paradise Pen Company is located in Pioneer Place, alongside Kate Spade, J Crew, Louis Vuitton and Michael Kors, just to name a few. Very swish. According to their website they have 15 locations across the US. We had great fun looking at the Montblanc, Aurora and Visconti offerings, as well as Cartier and Edelberg. I had never seen a Cartier and their fountain pens do not disappoint. But like their jewelry they have a considerable price tag ($1,000+). Lovely to dream and drool over though. 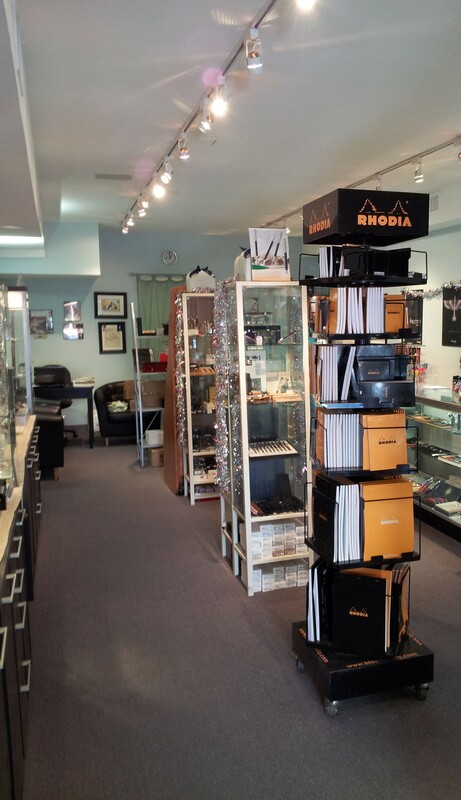 They had an impressive selection of notebooks and planners, such as Filofax and Rhodia. I got to fondle an Oberon journal for the first time and I’m so glad I did, because I have been considering purchasing one. 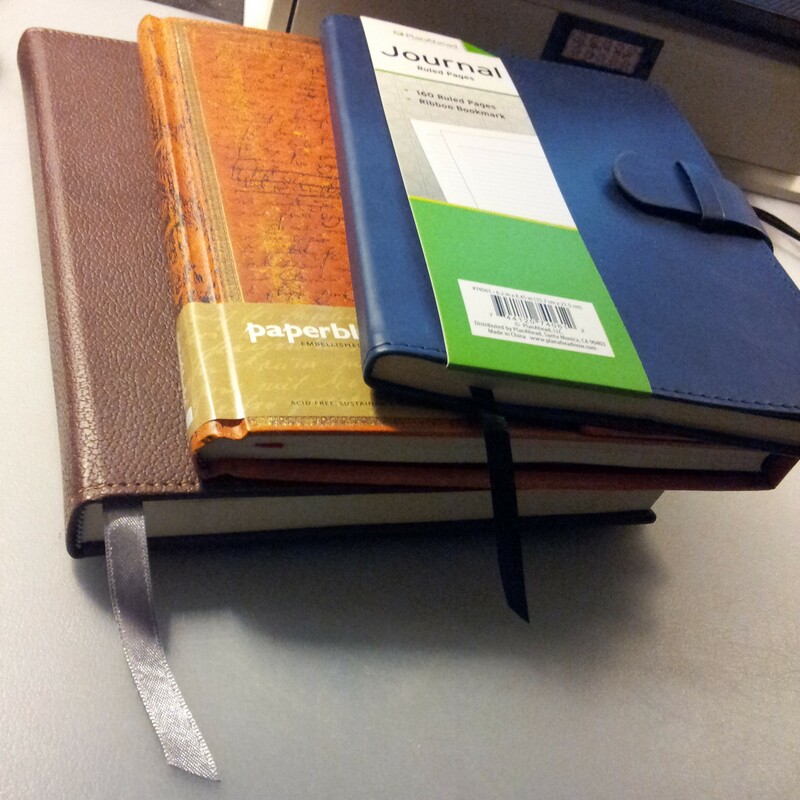 Although the leather craftsmanship is breathtaking I am not a fan of the paper in their notebooks. And they don’t lie flat, which is disappointing. But at least now I know. I was introduced to Scully notebooks and promptly fell in love. This beautiful “Old Atlas” journal has wonderful paper and lies flat as a pancake. But the price ($113) was just a little beyond my budget (especially when you consider the exchange rate these days). At least I am familiar with the product and can order one from their online site if I save my pennies. Stephanie was very friendly and interested in our very quick trip and the reason for it. She was very touched that we took some time to visit their store in our whirlwind tour of her city. I had done some research on their site before arriving so I had an idea of what I wanted. The pen is from ONLINE and is the Switch model. Designed for students, it has a medium fountain pen nib at one end and a stylus at the other. I thought it a wonderful metaphor for modern but elegant note-taking: casually surfing the net, finding something interesting, flipping your stylus round and writing it in your notebook with a fountain pen. And it was on sale! So I picked a green one. And amazingly Stephanie offered me a converter to go in it, a Schmidt. I did not know that brand of converter fit the ONLINE pens so that was a real bonus. I also found a Cross notebook in a size I have never seen before, so I chose one to match the pen. 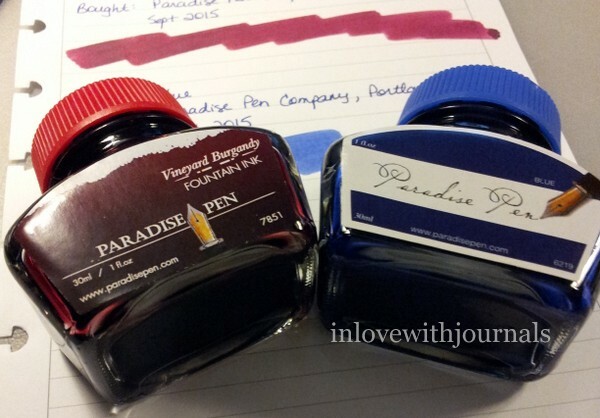 And finally I chose two bottles of ink: Vineyard Burgundy and Paradise Blue, made exclusively for the Paradise Pen Company. It occurs to me now I should have purchased a bottle of green ink to match the pen but I thought two bottles were enough. I really love these two colours. I also enjoyed the label although Stephanie told me they had a new label, with some new colours just released (Vineyard Burgundy being one of them). I like the old label, shown below on the blue bottle; what do you think? I haven’t inked up any pens with these inks yet. As for the new green ONLINE Switch I inked it up with Waterman Harmonious Green. 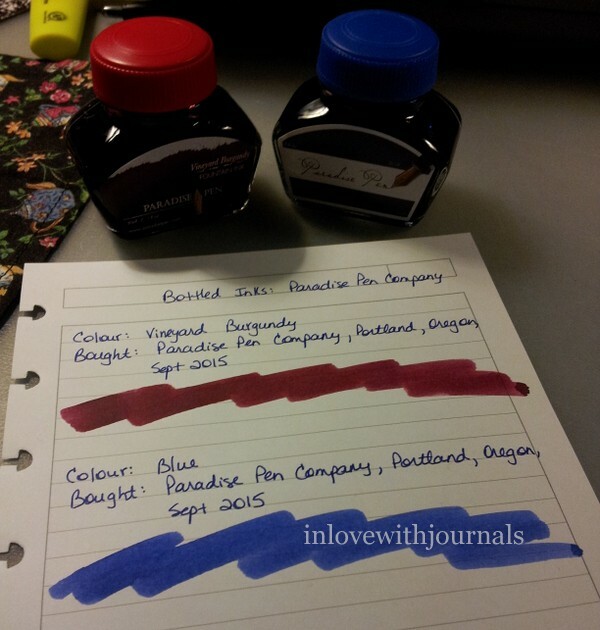 I was thinking J. Herbin’s Lierre Sauvage would be nice too. 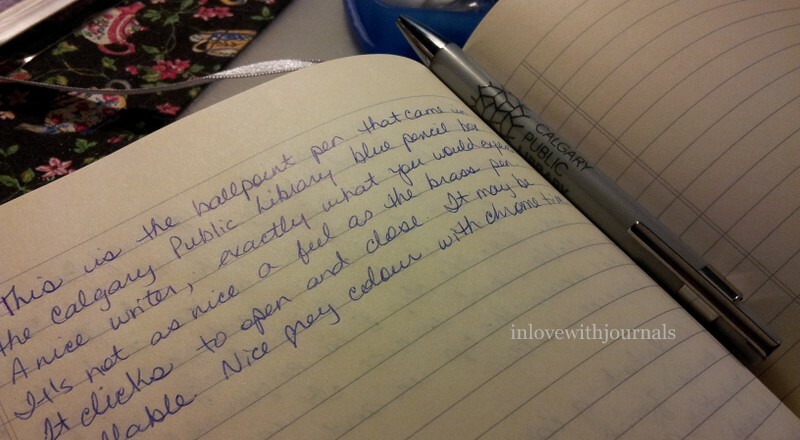 Here’s a writing sample on Leuchtturm paper. The slight shading in the ink comes through. The nib is a little hooked, much like my Waterman Junior, and is very smooth. The Switch is part of the Youth line and indeed, it feels very sturdy and puts down a solid line. It wrote right out of the sleeve with no skips or hard starts. It’s a fun pen to use. I’m very happy with my purchases and will write more about the trip in my Journal Writing Wednesday post. 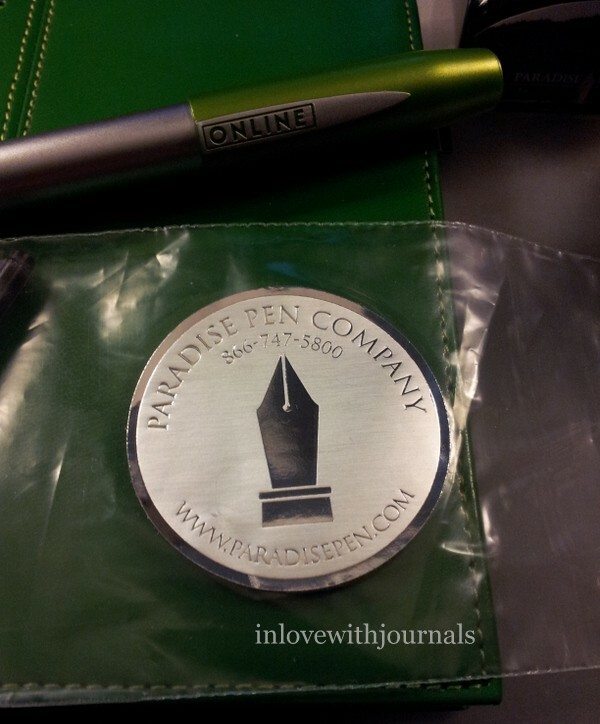 Thank you so much Stephanie and the Paradise Pen Company for a wonderful experience. Check out their online shop and if you are in Portland include this little shop in your travels; you won’t be disappointed. One of our weekly trips is to the library, usually on Saturday. 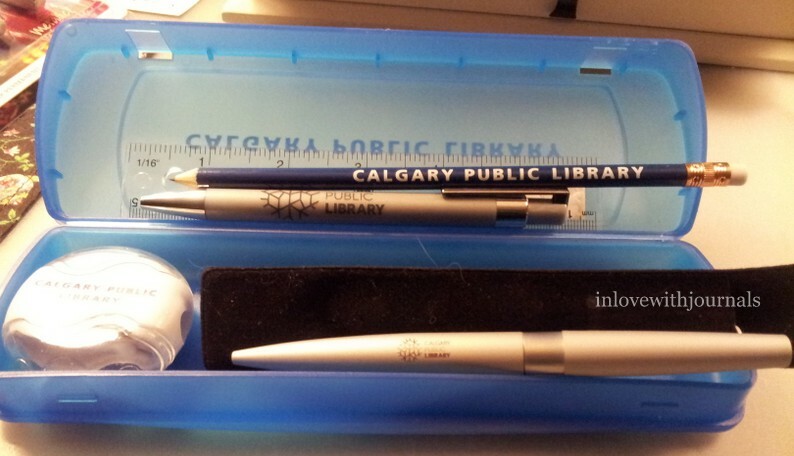 And this week I noticed they had a bunch of merchandise with the Calgary Public Library logo! I picked up a few things. Then we went to Staples and Dollarama, where I picked up some more things. 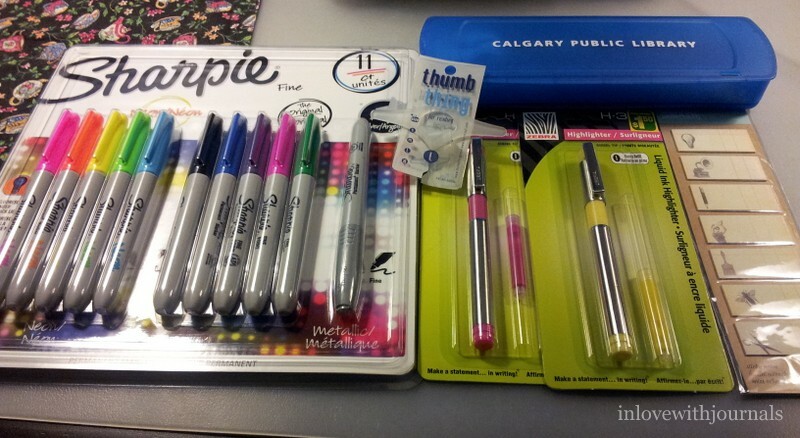 I picked up a pack of 11 Sharpie Fine markers at Staples, the highlighters and page flags at Dollarama, and the “thumb thing” and blue pencil case at the Calgary Library. The Sharpie pack was $10, a back-to-school special at Staples. I thought it was a good price judging by the fact that a pack of 5 Sharpies is $6. And this pack has some nifty colours. 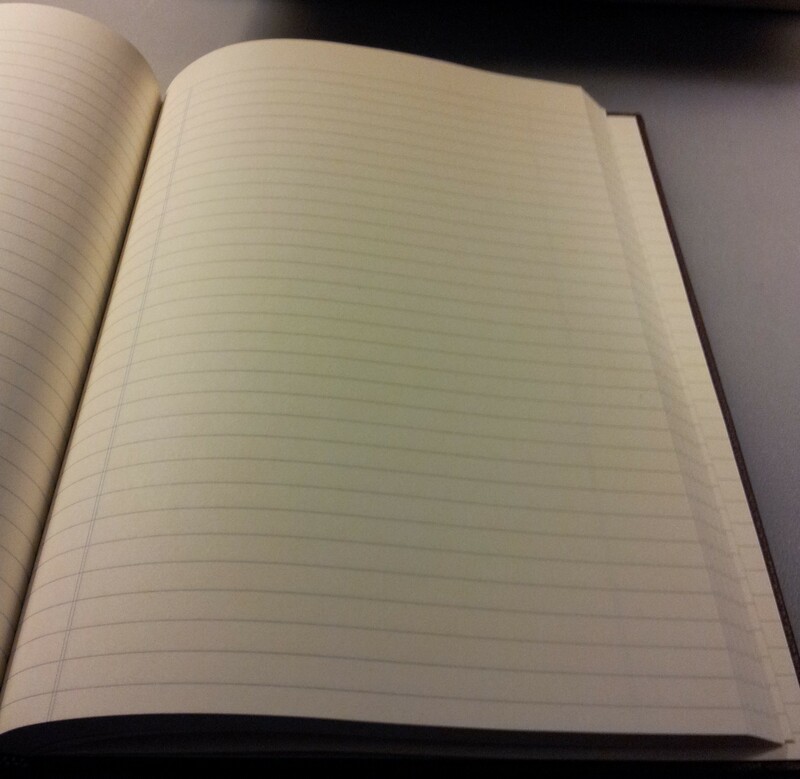 I did a writing sample in my journal to show you. The Neon colours are fun but hard to see, especially the yellow. The packaging said the Neon colours become fluorescent under black light. The regular Sharpies are vibrant and clear, just what you would expect. And the silver metallic is a lot of fun. I can see it looking great on black paper, along with the Neon colours. The highlighters and page flags I picked up at Dollarama. 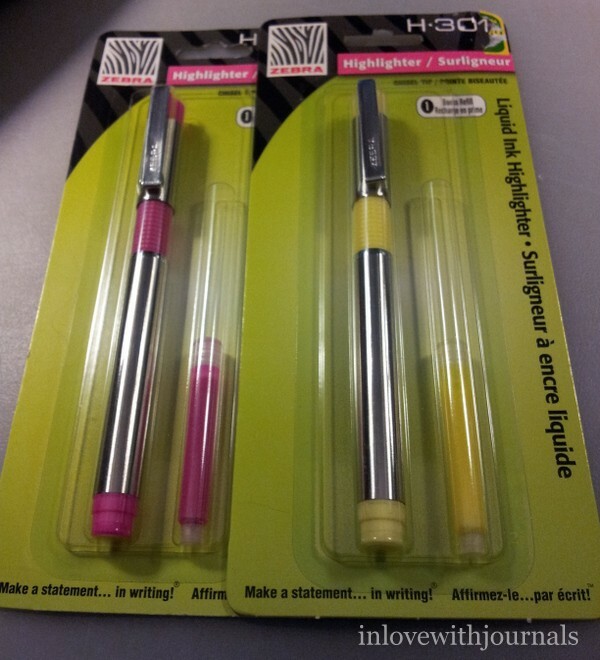 I thought the highlighters were interesting because a) they are made by Zebra, the same folks who made these fountain pens, and b) they are refillable and come with a cartridge refill. How cool is that?? The refills are available on Amazon but they are not cheap. Looks like the refills cost almost 8 times what the highlighter did at Dollarama! I tried out the pink one in my journal. 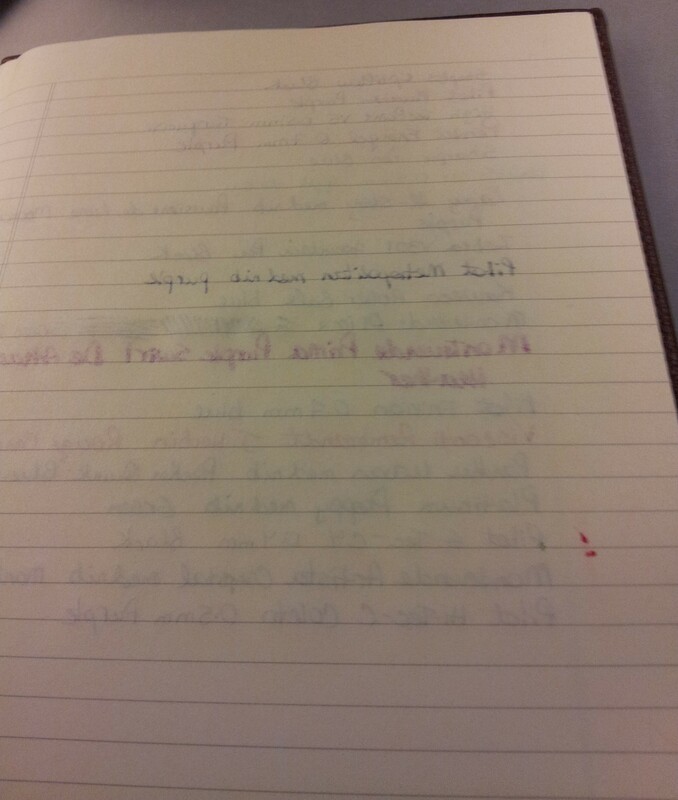 There was some smearing on the fountain pen ink (not surprising) but the ballpoint ink held up very well. Refillable highlighters are better for the environment. And the pen design is the same as for the fountain pens and I just find it so comfortable. It makes sense to me. I was surprised to find K & Company Smash items at Dollarama. Usually they are only at Michael’s and a little pricey. This pack of vintage-looking page flags was only $1. I’m always curious about the stickiness of any page flags other than PostIts but I wasn’t disappointed with these. They stuck on very well. Sorry for the blurry image; this must have been the 15th image I took! I just couldn’t get the focus right. But in terms of the stickiness they did not immediately curl off the page, which happens a lot, especially when buying flags from a dollar store. These ones seem a little better at sticking. 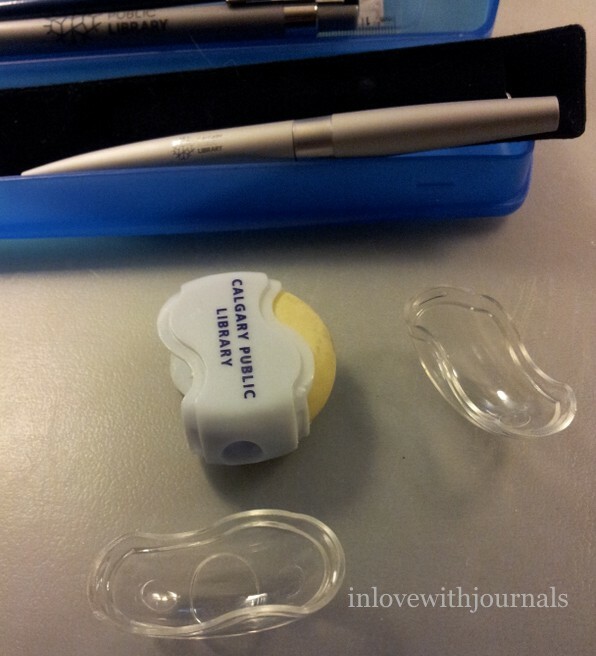 The “thumb thing” is available at the Calgary Public Library but it does not have the library’s logo on it. It is used to help your hand hold open the pages of a book. 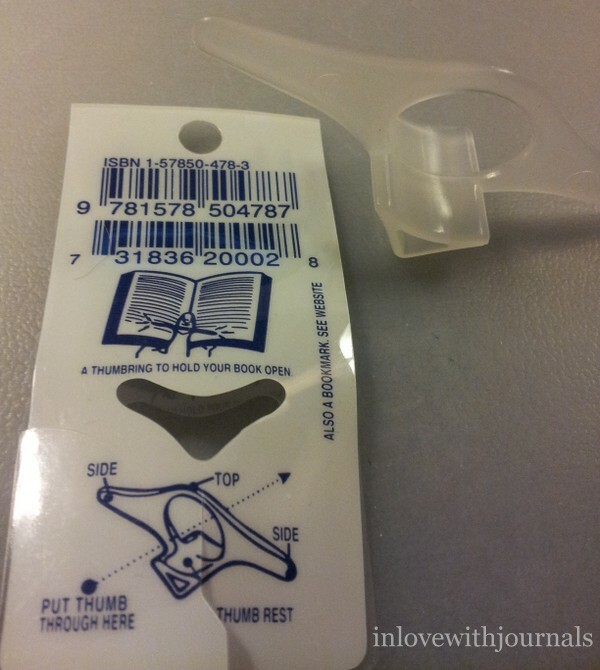 The back of the packaging says: a thumbring to hold your book open. It’s a neat little gadget that actually works. It was $6. Of course I couldn’t resist the Brass Pen with a clip that can be engraved. It is a ballpoint and very solid feeling in the hand. The finish is slightly textured and feels like velvet. Very smooth writer. In the picture above the brass pen is resting against the black velvet pouch it comes in. The cost of the pen was $7.50. The pencil case contains 4 items, which are all visible in the photo above: a small ruler, a plastic pen, a pencil, and a pencil sharpener which also has an eraser. Neat huh? The cost of the loaded pencil case was $5. 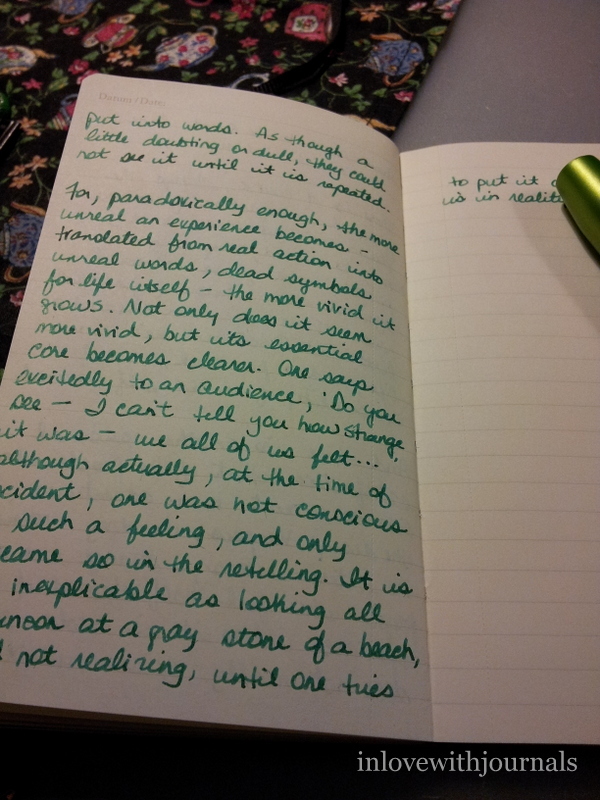 I did a writing sample in my journal, for each of the ballpoints. To advance the ink tip the barrel of the Brass pen should be turned in a clockwise motion until the tip appears, and vice versa to retract it. It was a pleasure to use. And here is the writing sample for the other ballpoint pen. It is much lighter than the Brass pen, being made of plastic. One click advances the tip, and another click retracts it. Nice colour ink and a very smooth writer. 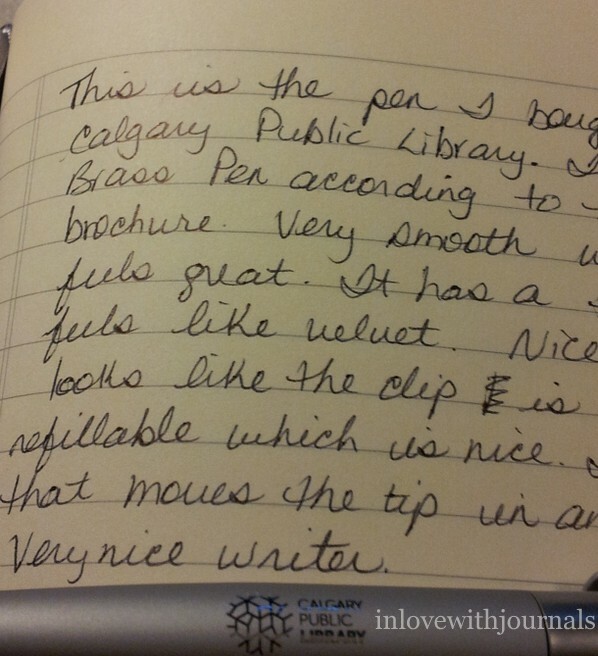 So last Saturday I found myself downtown and decided to visit Reid’s Stationers, my favorite pen shop in Calgary. I still had a Christmas gift card to spend and what better place than one filled with notebooks, pens and ink? 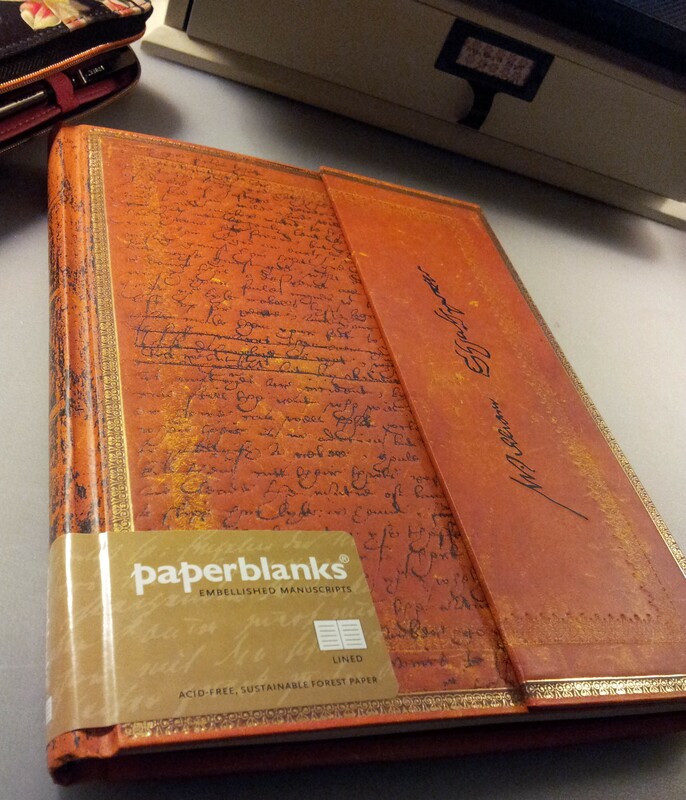 This was a journal-finding mission, for no other reason than I was in the mood to buy journals. So many choices. But I narrowed it down to three. 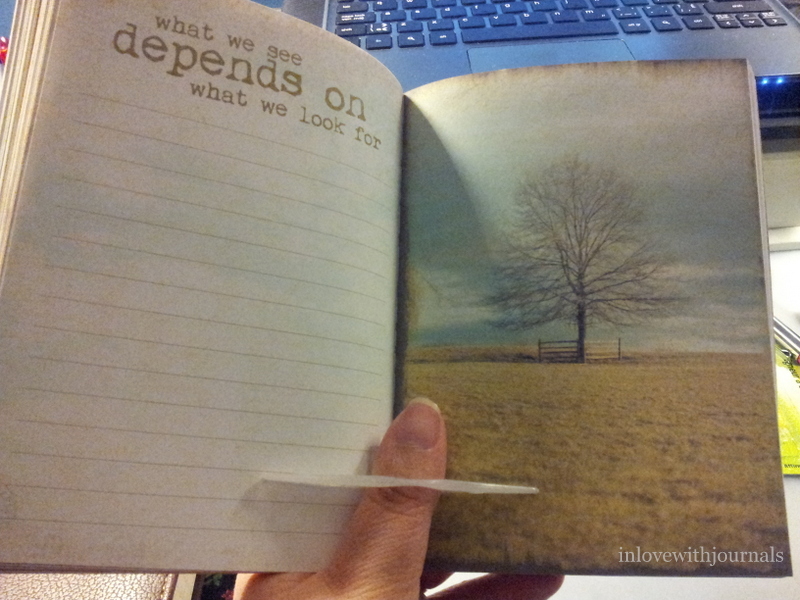 The brown on the bottom is a Winnable Executive Journal. 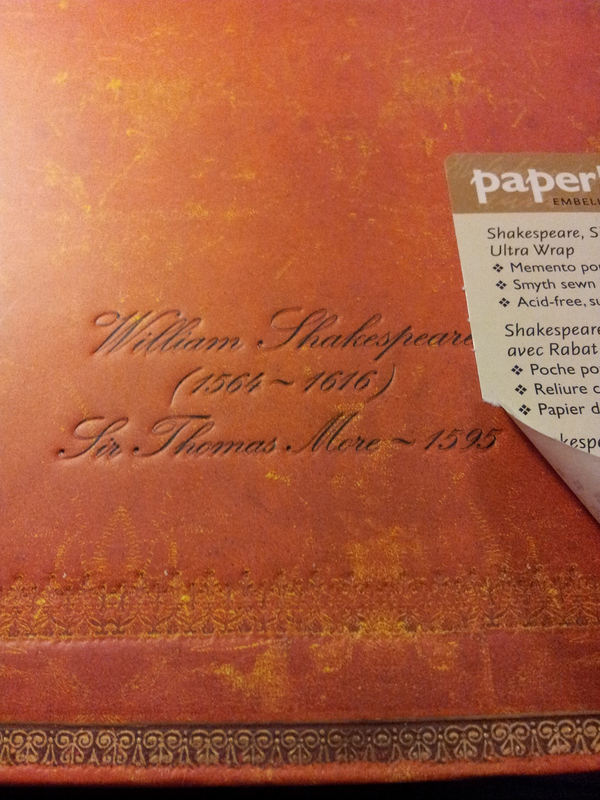 The orangey one in the middle is a Paperblanks William Shakespeare Sir Thomas More Ultra Journal. And the blue one on top is a Plan Ahead Journal. The Winnable Executive Journal has a leather-like cover with stitching all around the edges. The covers must have a layer of foam as they are rather splodgy (if that’s a word). 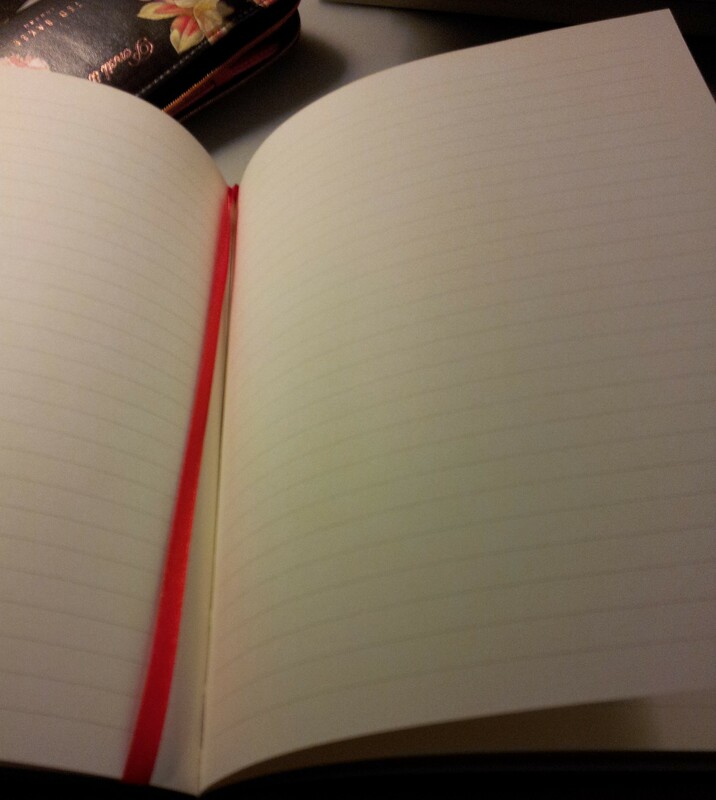 The cream-coloured pages have a 0.65 mm ruling, which I prefer. I did a pen test (which I don’t always do but I was feeling ambitious). You can see only the De Atramentis ink in the Monteverde Prima with a 1.1 italic nib showed any feathering. 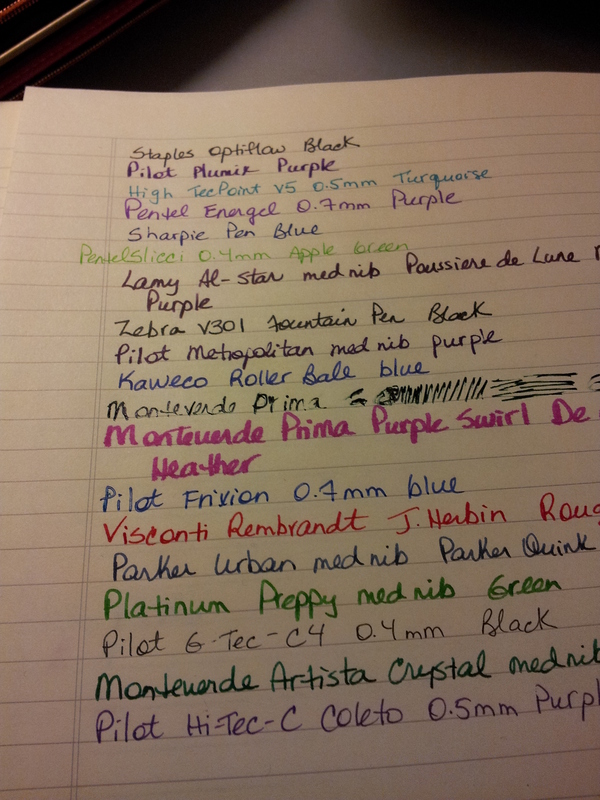 Please disregard the Monteverde Prima above it; I think the Green Swirl is running out of ink. I always have difficulties with that pen. 😦 Anyway, the ink test did really well on this paper. 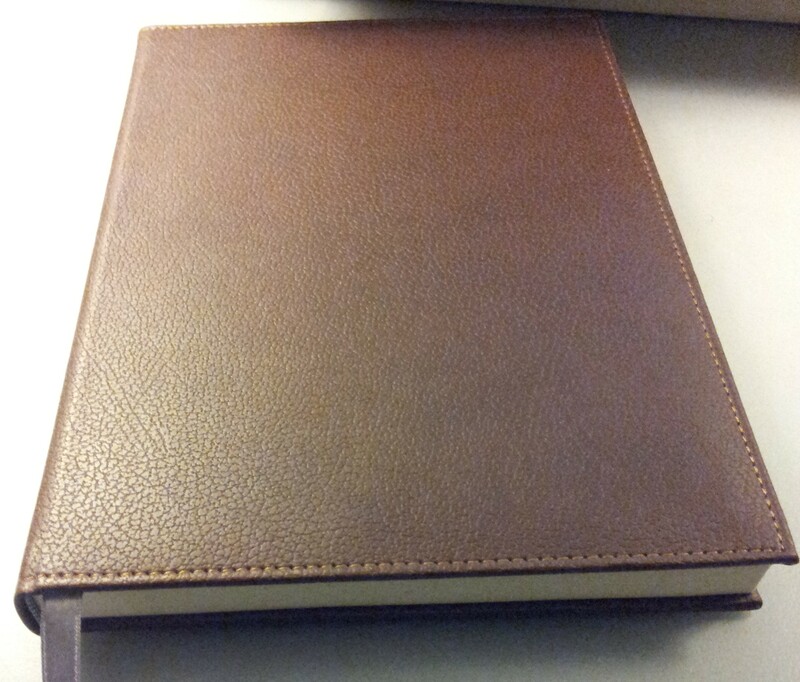 It’s not exactly the same as my Winnable Leather Journal but it’s close. The 1.1 italic feathers on that paper too. Show through is rampant, with the Pilot Metropolitan being the worst culprit. I suspected as much as the paper is super thin. This journal retails for $21.95. 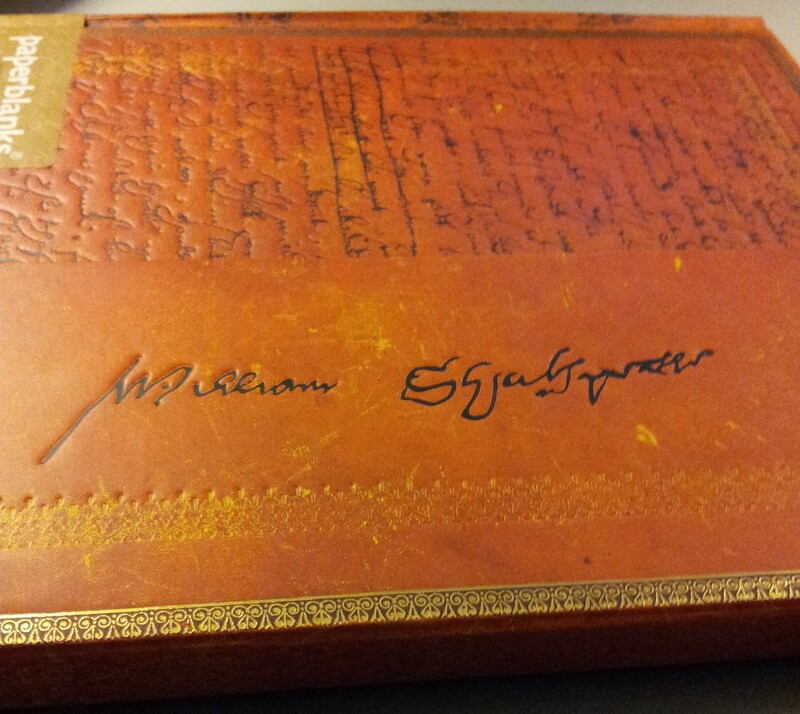 Next up is the Shakespeare journal for which I have been searching a long time. The cover is a facsimile of one of three pages of the play Sir Thomas More, of which Shakespeare was considered to be one of the authors. Experts have determined the pages are Shakespeare’s own handwriting, and the fly leaf shows one of the six known (and authenticated) signatures. I get chills just looking at it now. I almost squealed when I saw it in the shop! No surprises on the inside. 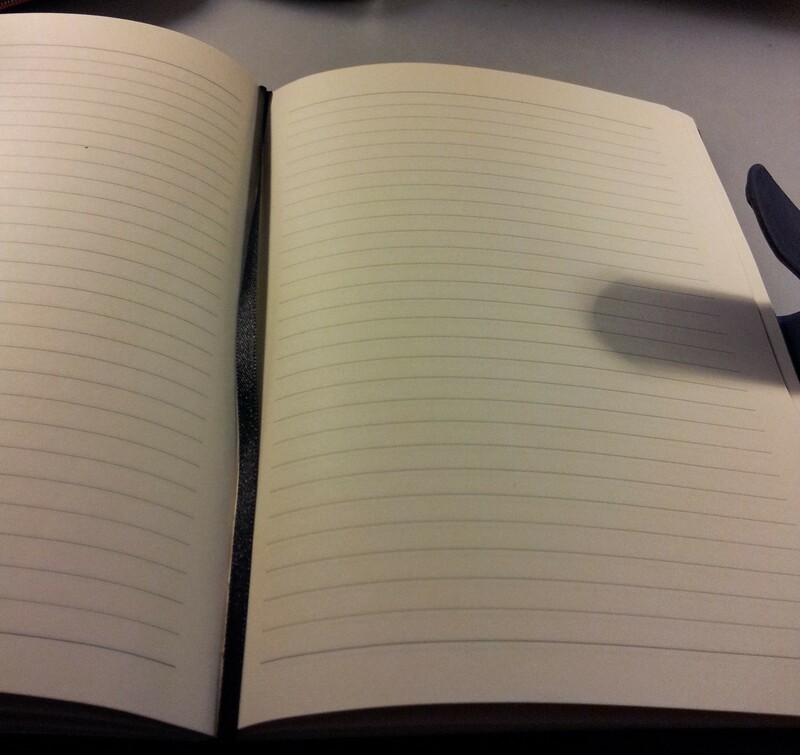 Standard cream, lined paper with a 0.8 mm ruling. And the ever-present red ribbon. Lovely inscription on the back. Here is another pen test on the Paperblanks. No feathering whatsoever with the italic nib, which one would expect because of the better paper. And no show through at all. Very nice. Exactly what one expects from Paperblanks. This journal retails for $24.95. 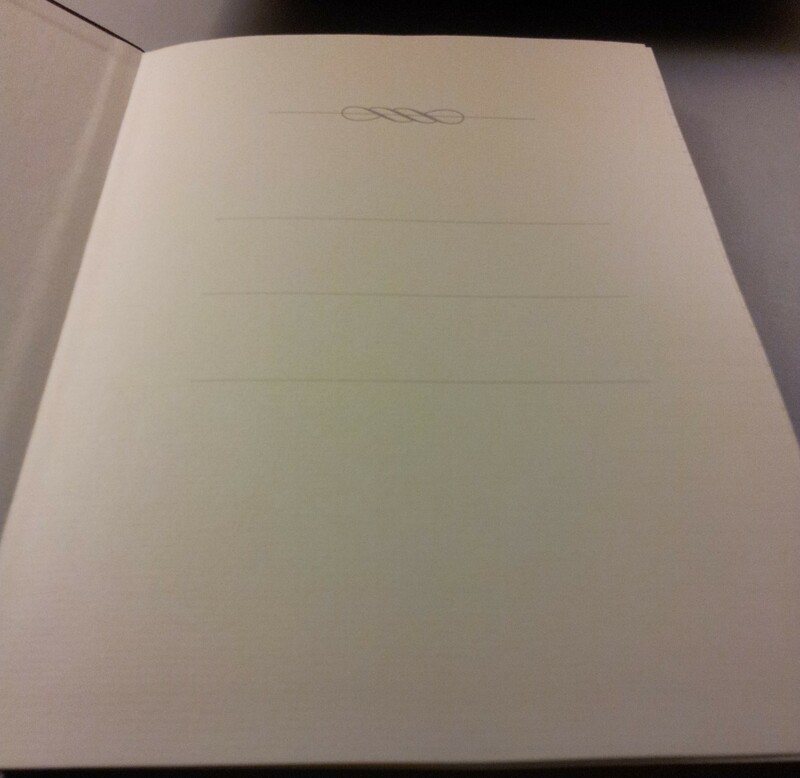 And finally a journal I’ve never seen before: the Plan Ahead Journal. 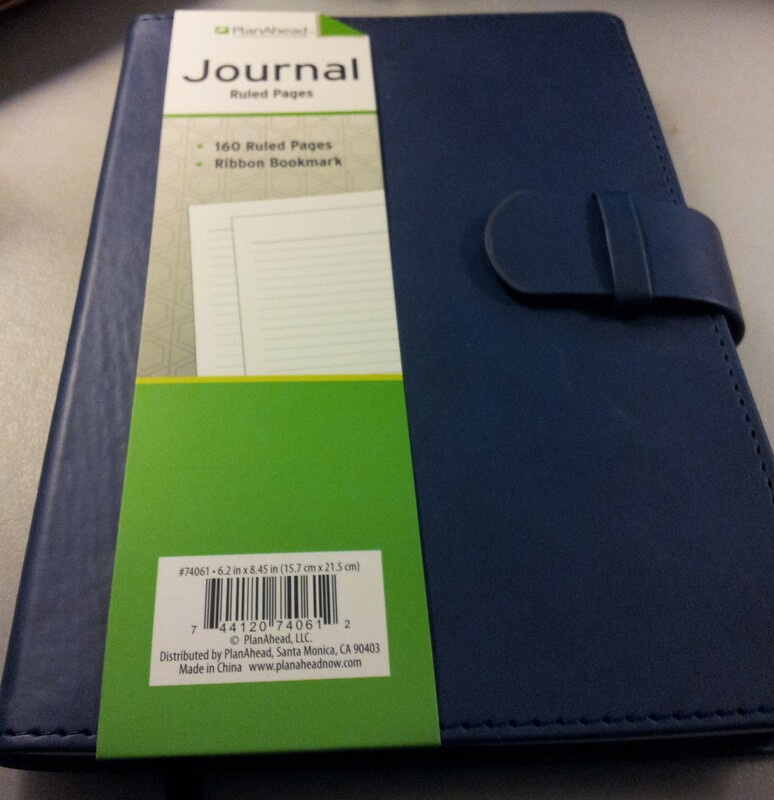 This small journal retails for just $8.99. At that price I couldn’t resist. Cream-coloured paper once again, with a 0.65 mm ruling. Lovely navy ribbon. Another pen test and interestingly, not as much bleed through on the Prima italic as with the Winnable Executive. Pretty much identical to the Winnable for show through. If show through is important to you the Paperblanks is the clear winner there. And it’s also the winner for no feathering. But for value for money you can’t beat the Plan Ahead Journal. None of them had pen loops, which was disappointing but hey you can’t have everything. I hope you enjoyed sharing my little shopping trip. 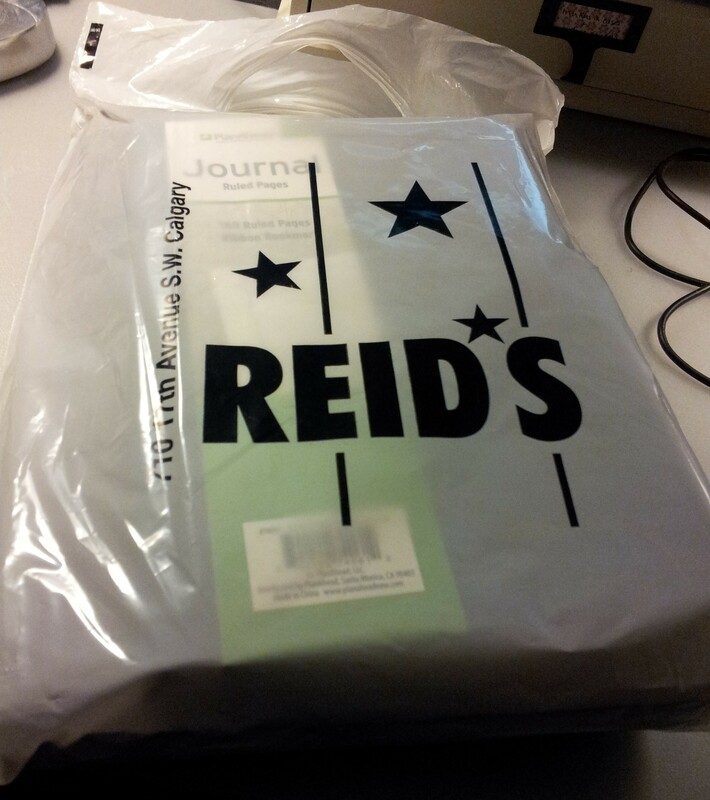 If you ever have a chance to visit Reid’s Stationers in Calgary, Alberta, Canada do not pass it up. Wonderful selection and amazing staff. And they do not sponsor me in any way; I purchased all of these items and all of my opinions are my own. When I was on holiday in Phoenix recently my sister and I visited Scottsdale Pen and Knife. We had a great visit with Jay Sadow, one of the shop owners, along with his wife Karen. Click here for their beautiful web site and here for their excellent blog. And don’t miss the video; it shows lots more of the store than my few photos. Look at that huge pen in the window! This is what you see as you walk in the door. It’s a small but mighty shop. 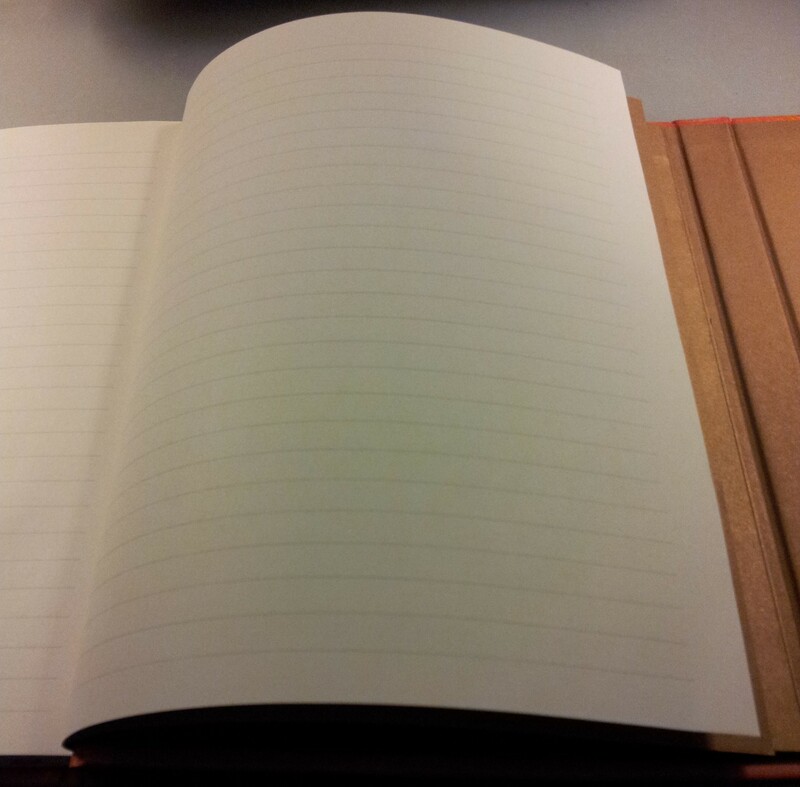 Beautiful Rhodia spinner that took my eye. Mr. Sadow had a fantastic variety of pens, accessories and notebooks, including a pricey Montblanc Writer’s Edition Imperial Dragon 3 Piece Pen Set. We saw the box, straight from the factory, unopened. He explained if one is going to invest in such an item, one wants to be sure no other hands have touched it. Imagine knowing you are the first to break the seal and expose the wonder of such beauties to the air, for the very first time. It’s that kind of sensitivity to pen collecting that makes Scottsdale Pen and Knife a very special place to shop. 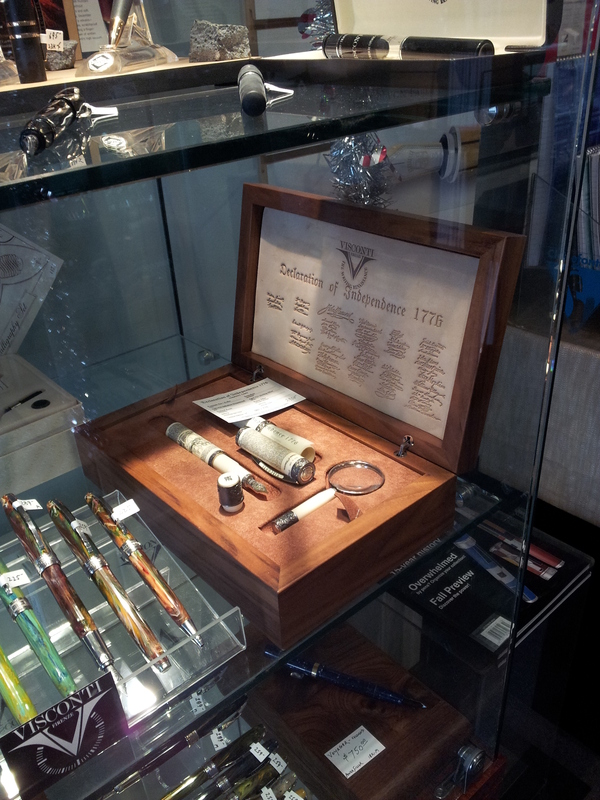 This beautiful Visconti display case is to the immediate left when you enter. 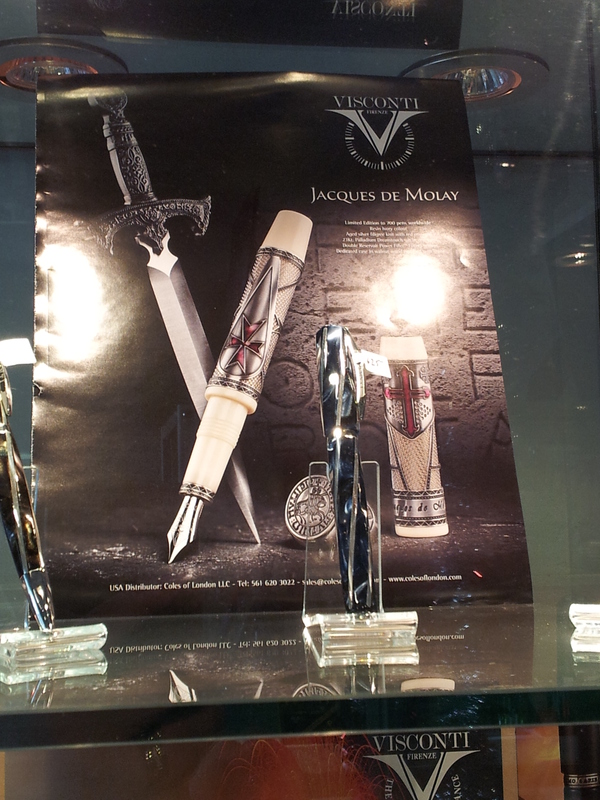 I couldn’t take my eyes off the Jacques de Molay pen advertised in the poster; I’ve never seen it before. So beautiful. And the Viscontis in the case weren’t bad to look at either! In the foreground you can see the beautiful blue and brown Divinas. Oh the famous Declaration of Independence Fountain Pen. Such a breathtaking set. 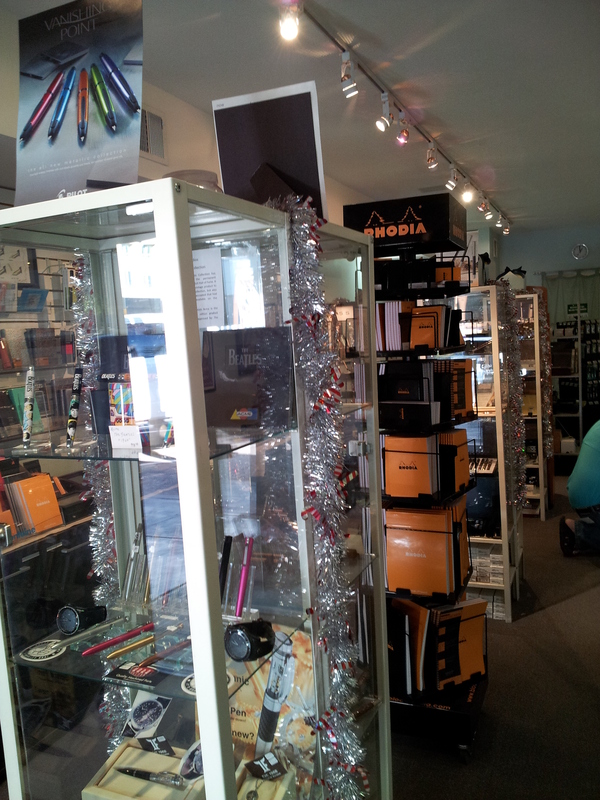 And on the top shelf you can see the Visconti Traveling Ink Pot – very tempting! Here’s a better picture of the ink pot. And in behind you can see the excellent display of notebooks, from Moleskine to Quo Vadis to Clairefontaine. And this is the view from the other side of the shop. For a while we had the shop to ourselves and enjoyed a lively discussion with Mr. Sadow. I am so grateful that he let me take a few photos. (Any mistakes there might be as to the pens I describe in the cases or indeed in the text of this post are mine alone.) I also learned from him that Mark Twain used a Conklin and was in fact a spokesperson for the brand in 1898. 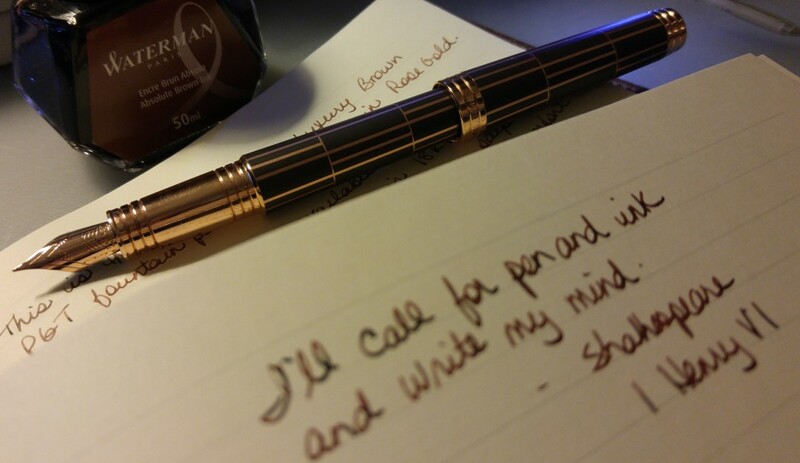 I felt my resolve falter when I saw the Conklin Crescent Filler Chased Rose Gold fountain pen. I prefer it to ten other fountain pens, because it carries its filler in its own stomach, and I can not mislay even by art or intention. Also, I prefer it because it is a profanity saver; it cannot roll off the desk. I told him what I was looking for and how much I wanted to spend and he showed me a few beautiful examples. In the end I chose the Monteverde Artista Clear Demonstrator with a medium nib; a folding 10x magnifier (on the advice of SBRE Brown); a Pilot Plumix in purple; two Platinum Preppy pens, in blue and green; another box of Pilot Mixable Colour cartridges; and an orange leather Rhodia notebook holder with notebook included, graph style. I will elaborate on each of these items in Part 2. I loved all of the displays, especially the Visconti. A wonderful morning spent in the company of pens, ink, and paper, and wonderful people to share it with. If you are in Phoenix and in the Scottsdale area do drop in and say hello. You’ll be glad you did.